Many students are diving into one of the newest sports here at Rose. This year will be the second season for the diving team, and it is expected to be a season of growth. With four new divers the team has doubled in members compared to the team last year. “We need underclassmen because there will only be four people that can [come back] next year,” freshman Rachel Davenport said. People are joining the diving team for many reasons. Some are joining to participate in a winter sport, and some are joining as a way to stay in shape. Others have found diving interesting because of sports they have done outside of school. Some new members have previous experience with gymnastics or a different form of tumbling and have joined because of the similarity. Those who have a history with gymnastics seem to be having an easier time learning diving techniques. “Gymnastics helps because I already know how to use form and a lot of stuff we do off the diving board is related to gymnastics,” Davenport said. Most new members have no history with diving and are starting from the very beginning. “I thought it was [going to be easy], but it was really hard actually,” Godwin said. In addition to gaining more people, the team is hoping to learn more dives. 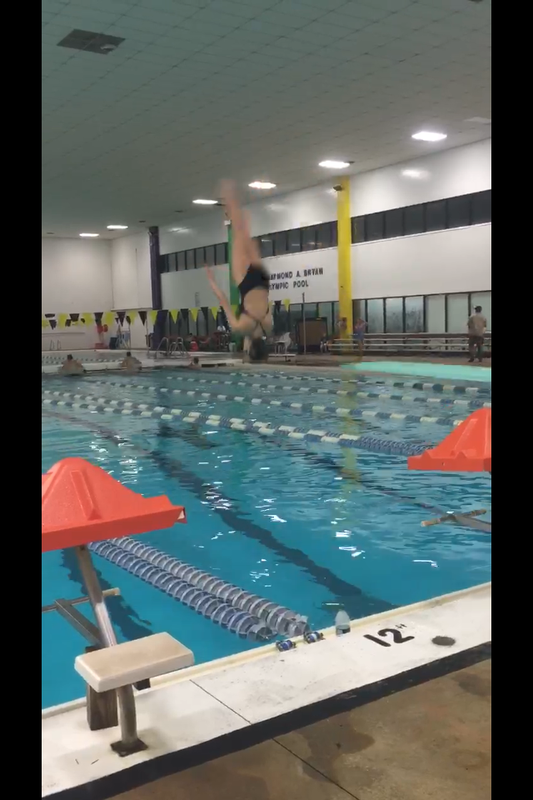 In order to compete in states, each diver must have at least 11 dives prepared to show judges. Returning members are focused on learning different and more complex dives to add up to the 11 dives needed for states, and new members are focused on learning standard dives and techniques. “I hope to actually learn the dives so I can compete,” Godwin said. Diving is also different from most other sports provided by Rose. It is the only other sport besides swimming that takes place in a pool, and each diver competes individually for a personal score given by a judge. One thing that really sets diving apart from other sports at Rose is where they practice. Practices take place twice a week for an hour and a half at the Goldsboro YMCA. Despite the commute to Goldsboro, people are still making an effort to practice. With such a new and inexperienced team, everyone is looking to grow. “Last year was the first year we did it, so it’s different, and no one else has done it at Rose,” junior Macy Powers said. As this new season of diving begins at Rose, the athletes remain hopeful for a successful year as they get the program up and running.